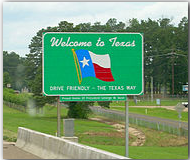 Thank you for visiting our Texas Relocation Guide. Inside you will find information about the beautiful state of Texas and the cities and towns that make it unique. Texas is the second most populous and the second-largest of the 50 states in the United States of America, and the largest state in the 48 contiguous United States. Located in the South Central portion of the United States, Texas shares an international border with the Mexican states of Chihuahua, Coahuila, Nuevo León and Tamaulipas to the south, and borders the US states of New Mexico to the west, Oklahoma to the north, Arkansas to the northeast and Louisiana to the east. Texas has an area of 268,820 square miles (696,200 km2), and a growing population of 28.3 million residents as of 2017.